Built in 2011, Aria 1 is a 56m (inc. bowsprit) modern classic sailing yacht, an authentic schooner, that combines state of the art construction with a timeless and elegant design that harks back to the classic yachts of the previous century. Exceptional seakeeping and performance under sail make her an exciting base for those looking to experience the thrills of traditional sailing and life right on the water. Aria 1’s experienced Greek crew of seven are experts in all that the Greek islands have to offer and will help create an unforgettable custom itinerary for her lucky guests. The boat will be carrying on deck two tender boats, 1 X 5.3m RIB ZAR with 175HP outboard and 1 X TBA, which will be used for the safe carrying of crew and passengers from the yacht when at anchor to the shore and back always at the discretion of the Captain in safe weather conditions and within the speed limits of the area. A crew member will always be in charge of each tender at all times. These tender boats cannot be used for water-skiing nor for towing any other inflatables. An expansive flat 50-meter teak deck, paired with her large beam, ensures generous on board spaces, both indoors and outdoors, with her charter guests able to take their pick from the many different spaces. No less than three separate dining spots are on offer, perfect for every occasion whether a spectacular Greek feast prepared by Aria 1’s a talented chef, or a relaxed al fresco breakfast. Outdoor spaces abound and the aft deck houses an outdoor bar and full dining set up connecting with a lounging area. The forward deck offers yet more space to lounge, with a large settee and sundeck that converts to reveal a folding dining table for 12. Side boarding ladders to port and starboard give guests easy access to the sea for swimming in the warm, azure waters. Flying the Greek flag with full permits to cruise to the Greek islands from her home port in Piraeus, Aria 1 is an award-finalist yacht and the perfect way for exploring all that the Greek islands have to offer. 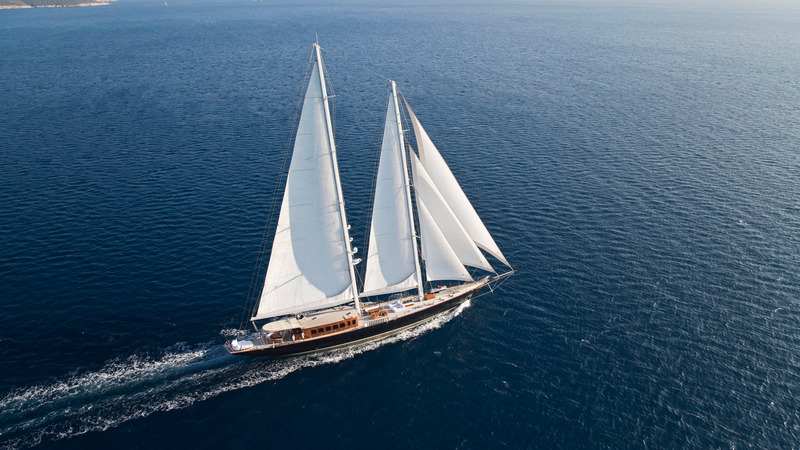 Aria 1 is one of the largest sailing yachts available for charter within Greek waters. With proven star-quality, she made a cameo appearance in the James Bond movie Skyfall taking Daniel Craig and his Bond girl in style to the villain’s private island!